We will work through the example in Preston et al., sections 2.2 and 2.3. I copied the counts of mid-year population and deaths by Age for Sweden and Kazakhstan from Table 2.1 into a text file which is available in the course website. The file is in "long" format. As usual I show the analysis in R and Stata. 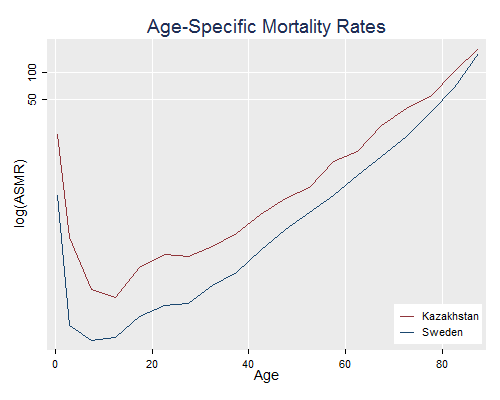 The interesting result here is that mortality appears to be lower in Kazakhstan than in Sweden. Following Preston et al., we will standardize the rates using the weighted average of the two population compositions as the standard. To do this we calculate first the percent distribution in each country and then average. While we are at it we will also calculate the average rates. Now we can easily compute the standardized rates using the average composition as the standard. Because we assigned the grouped data to p21 we can skip the grouping step. 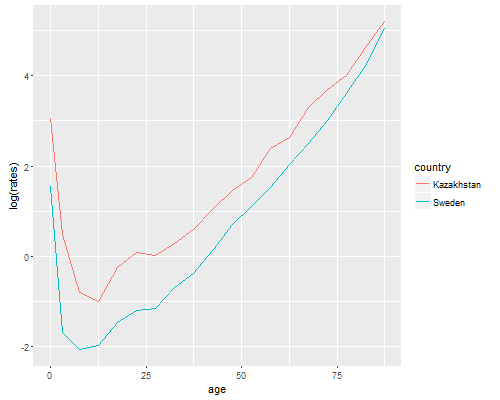 We see that once we adjust for age composition the mortality rate is in fact higher in Kzakhstan than in Sweden, in fact 61.1% higher.
. quietly sum rates [fw=pop] if country == "Kazakhstan"
. quietly sum swrates [fw=pop] if country == "Kazakhstan"
Mortality is in fact 77% higher than it would be at Swedish rates with the observed composition. Preston et al. show how to decompose a difference between two rates into a part due to compositional differences and a part due to differences in rates. The first part is obtained applying the average composition to the observed rates. To assess the second component we apply the observed composition to the average rates. So a difference in 3.13 points in the CBR between Sweden and Kazakhstan results from a compositional effect of +7.63 and a difference in rates of -4.51. I wrote a Stata program that can do these calculations for data in "wide" format. In net-aware Stata type net from https://data.princeton.edu/eco572/stata and check out ddrate. So far we have focused on attempts to summarize mortality in a single number, but why not look at the complete set of rates? I would like to plot the rates using the mid-points of the ages groups (with 87.5 for 85+). To compute these I first convert age from a string to numbers (1 to 19) and then figure out the midpoint of each group.
. replace agem = 0.5 if ageg == "0"
. replace agem = 3   if ageg == "01-4"
The aim of standardization is to control for a compositional variable. This, of course, is also one of the aims of regression analysis. I now show how one could analyze the data using Poisson regression, a method appropriate for count data. This regression technique assumes that the number of deaths has mean (and variance) given by the product of a rate and exposure time. The log of the mean is then the log of the rate (which is modelled using a linear predictor, just as in linear regression) times the log of exposure (which is defined as an offset, or a fixed part of the linear predictor). That's why the code below computes the log of the mid-year population counts. We also represent country using a dummy variable for Kazakhstan.
. gen kz  = country == "Kazakhstan"
Exponentiating the coefficient of Kazakhstan we see that on average age-specific mortality is 61.5% higher than in Sweden, a result very similar to the 61.2% that we obtained using direct standardization. An advantage of the regression approach is that one can easily control for multiple confounders. Also, we can test for the presence of an interaction, which would question the validity of the additive model underlying direct standardization. In this case, adding the interaction would make the model saturated for this data, so we just test goodness of fit. If the discussion in the last section doesn't make much sense to you don't worry. Just make a note to come back and re-read this part after you take WWS509/POP507, the generalized linear models course.